What is your primary business goal? Are you focusing on consumer acquisition? Are you trying to maximize return on investment? Whatever your business goals, they are a critical part of your omnichannel strategy since they will directly influence your marketing mix. Are you mostly targeting age groups between 20 and 40? Mostly female? Professionals? Is your ideal customer interested in specific activities? These are just some of the elements of your target persona that will help you identify the right look, the right messages and the right campaigns that will help you drive your business. Your website may seem like an odd place to start an omnichannel campaign, but it’s critical. Eventually all other marketing efforts will lead back to your website. That means you must design with a user experience tailored to your target consumer persona. Your website should include all the technology and innovation you need to focus on conversions and should provide an app-like mobile experience to ensure ease of use and navigation. Your local search presence and SEO strategy are key aspects of your omnichannel strategy. Run a presence scan to understand if your business is listed everywhere and correctly. Consumers often look up your information directly in apps like Apple Maps or Yelp – make sure you are getting found. Ensure that you rank well for both branded and non-branded keywords to keep your business top of mind. And don’t forget about voice search – In just two years, over 50% of search is expected to be voice-based. Social media advertising is a critical channel in your marketing mix. Focus your social campaigns on events in or near your business, highlight consumer experiences or drive home the unique selling points of your business that your target consumers value the most. Whether it’s Google, Bing, Yahoo – or all three, having a well thought out paid campaign is a key part of your omnichannel marketing strategy. From protecting brand equity to driving offer-specific traffic, paid advertising campaigns are a must-have vehicle. The same can be said about programmatic display advertising. In fact, through personalization and audience segmentation, combining your in-house data with advanced targeting techniques is a great resource for engaging consumers who are on the fence or for driving that final conversion. Meta-search engines continue to be ideal venues for driving awareness for your business and for building interest as consumers decide who to trust with their spending dollars. 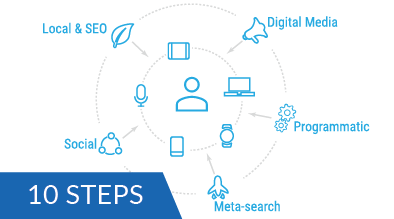 Having an effective meta-search element to your omnichannel campaign is important regardless of your long-term goals, since building awareness and consideration are always key aspects of building your demand funnel. As part of an omnichannel program, your email marketing campaigns can take on completely new roles. Email marketing is an ideal means of driving post-conversion revenue like upgrades, adoption of ancillary products or services and in fostering repeat business from past customers. “Omnichannel” is often thought of as a “strategic” initiative, something that encompasses all your efforts over the course of the entire year. That’s definitively one part of an omnichannel strategy, but each year there are literally dozens of opportunities to leverage omnichannel techniques in more limited, highly segmented ways. Whether it’s an Easter special, a Memoria Day event, Holiday campaign – even that local fair your city is known for – each special event this year is an excellent opportunity to use an omnichannel approach to fill your hotel. This quick “top 10 list” is just the beginning. A properly designed omnichannel marketing programs requires close coordination between your in-house marketing team, your agency, and your website developers. Planned and implemented properly, an omnichannel campaign – either event specific or global – will provide you with higher ROIs and will boost returns.